The Clay Sanskrit Library is probably the most important thing to have happened to Sanskrit literature in the last century. Not only has it produced attractive, authoritative and very accessible (bar the price tag) editions of the Sanskrit literary classics, it has also delved deep into the recesses of library store rooms to bring several great but obscure texts to the light of day. Bhanudatta’s Rasamanjari and Rasatarangini are two such hidden treasures. As the book’s cover slip tells us, “Bhanudatta is probably the most famous Sanskrit poet that no one today has ever heard of.” His two poems here are a sort of user’s guide to the idea of rasa, literally ‘taste’, which was developed over several centuries into a complex aesthetic theory. The second poem, the Rasatarangini or River of Rasa, is divided into ten ‘waves’ which describe the various things that go into producing rasa. 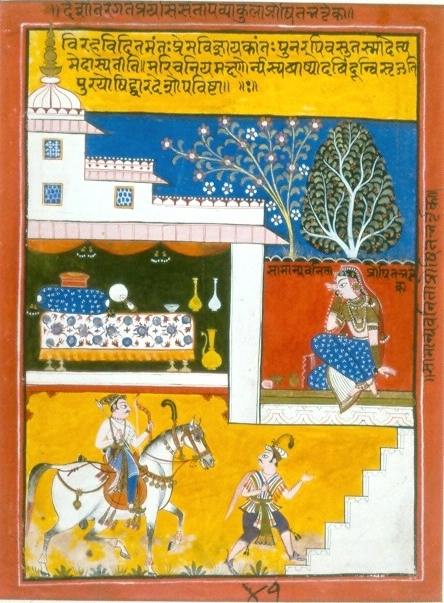 The second, the Rasamanjari or Bouquet of Rasa, describes the literary heroine and hero as they should be. As they should be because the theory of rasa and the literature it describes and produces depends, as Pollock notes, on “typicality”. Rasa is produced when certain emotions, factors, feelings and reactions combine. And all of these constituents are pre-defined, poets have a menu from which to choose one or more of each in order to effect one of the eight (later nine) rasas. If you deviate from this, by, for instance, having a scenario which involves an older woman and a younger man, you will produce something that is vi-rasa, literally rasa-less. Thus characterisation is all but not existent and in its place we have a “characterology”, where we are given precisely defined character types who are in every way predictable. None of this makes it easy for this literature to be enjoyed by a Western audience accustomed to characterised emotion as opposed to generalised emotion, as Will Johnson argues in his essay Translating Shakuntala, and which, if it thought at all about why an artistic representation provokes emotion and what kind of emotion it is, would more likely turn to psychological explanations. The Greeks asked similar questions about why we enjoy the depiction of human misery. The Odyssey contains an answer of sorts. When Odysseus sits as a stranger among the Phaeacians and listens, with them, to the poet-bard sing of events from the Trojan war in which he had fought, he secretly cries while the rest of the audience delights in the song. For Odysseus, the bard’s poem is too close to home; for the Phaeacians, none of whom were there or were affected by the war, it is a good story – as it is for the bard’s ultimate audience, the person reading or listening to the poem. and who so excite our fancy. glances of quick black bees. The incredibly detailed notes identify not only which verses were depicted and where they can be found but also offer tantalising snippets on how each artist has interpreted a particular verse. For the verse quoted above for example Pollock tells us that the painter has turned “the glances…into actual bees”. It is a great pity that none of the paintings are reproduced here. Nevertheless, the Clay Sanskrit Library’s website makes up for this in part with a Flash presentation of several of the pictures (like the one above), as well as an image of the manuscript and downloadable excerpts. I respect and appreciate your attempt to produce a version of the verse from Sakuntala which would work well in a Western dramatic performance. I also agree in general with your comments about the distancing required for a prototypical rasa experience. However, it seems to me there is one special feature in the original which is worth preserving. Kanva as a forest dwelling sage has given up personal relationships, especially family ties. He is thus ambivalent about his own sadness at the approaching separation from Sakuntala. Still very much a human being, he is unable to curb his all too paternal grief. But his training and discipline as a muni enables him to divert attention from himself by sympathizing instead with the even more painful feelings of ordinary fathers. Kalidasa’s verse beautifully captures the brief flickering of personal emotion before it is sublimated into a tranquil generalization. While this is not “dramatic” in the Western sense, it would still provide a good actor with a great opportunity to express the subtle transformation of one emotion into another. A similar transition is found in the last verse of the act when a daughter is finally compared to deposit returned to its original owner!